This firm has developed and implemented an excellent program that has been in use for three years. A full-time Supervisor, who focuses on Safety, administers the program and completes regular Safety Inspections as well as Toolbox Talks. Preventing fires is of critical importance to the roofing industry and is paramount to this firm’s commitment to safety. Therefore, all employees are trained according to the manufacturer’s specifications and recommendations. The Roofing Specialists Inc. is committed to using fall protection on every job site as according to WSIB (Ontario) and Occupational, Health and Safety Code of Ontario. All employees are trained in how to use fall arrest equipment and guardrails correctly and regular inspections ensure that compliance is maintained. The Roofing Specialists Inc. believes that standards can be maintained and improved through the education of their employees. Through the Training and Adjustments Board of Ontario Representative (the Industry Training Authority), employees have the opportunity to participate in an apprenticeship program. Through our suppliers we also provide job- and product-specific training, as well as our own in-office training; we strive to always improve ourselves. 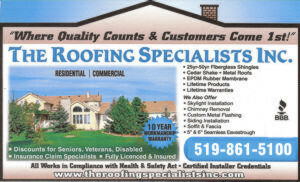 Thank you for your interest in The Roofing Specialists Inc. Company Safety Program. If you require further information, please contact our fulltime Supervisor, who focuses on safety, Mathew Dery (519) 861-5200.